Here are some common questions about how we work. You are welcome to visit us to drop and collect your luggage. We are open from 7am to 10pm every day (except for New Year and Nyepi). Our team lives onsite for constant supervision and we can be open after 10pm or before 7am on request. If you prefer to book an optional luggage pickup service then please email us in advance to make a booking. Continue here to contact our team or see where we are located. What size of luggage can I store? Our rates are valid for any item that you can carry with one person. If you have a larger item that requires two persons or more to carry please contact us for a special quote. We get a variety of items in our store room. The more common are suitcases, bags, surfboards and boxes. We also get bicycles, guitar cases, motorbikes, wheel chairs, house hold items etc … . Can I access my luggage throughout the storage period? You are welcome to access your luggage as often as you like providing the luggage stays at our store room. If you leave with your luggage then that will be considered the end of storage and payment will be due. Can I shorten the period of storage? Yes. We understand that travel plans can change and sometimes you need your luggage back earlier than you initially planned for. If the storage period becomes shorter then we will adjust the pricing to the shorter period. Can I extend the storage period? Yes. Just send us an email that you will need extra time in storage and we will adjust your booking immediately. Payment will then be updated to match the new storage period. Can you collect and return luggage? If you cannot visit our store room in Sanur then we offer optional luggage collection and return delivery services all over Bali. We can meet you at the Bali airport, your hotel, the harbour or anywhere else. Luggage collection and return delivery come at an extra charge. Please contact our team for more information. Where is the meeting point at the international arrival terminal? 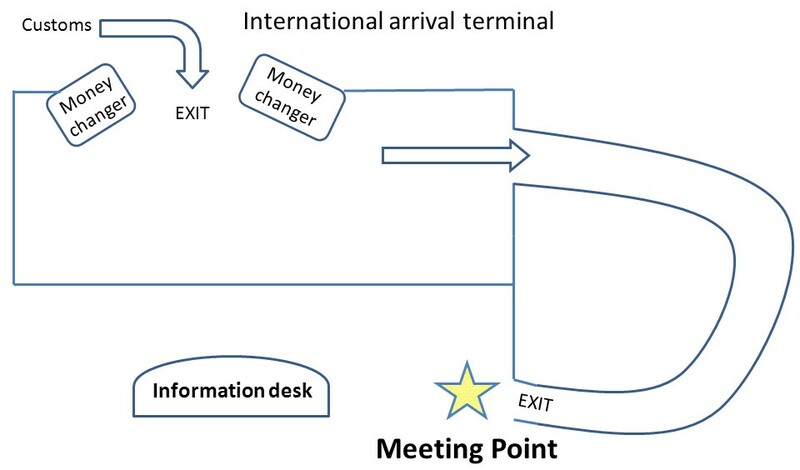 Our driver will meet you after you exit the international arrival terminal at the meeting point shown below. Our driver will be carrying a signboard with your name written on. Please give us a call in the unlikely event you cannot see our driver. Our number is +62 812 4686 5525 (phone and WhatsApp). Floor map of meeting point. Where is the meeting point at the international departure terminal? Please look for our driver at the curbside of the car drop zone at the international departure terminal (highest floor). This car drop of zone is the area where taxis and cars stop to unload luggage and passengers. The driver will be waiting at the furthest end of the departure drop off on the third floor. This is the least crowded and will be easier to spot our driver with your luggage. This is a picture of the spot where our driver will be waiting. Where is the meeting point at the domestic arrival terminal? Our team will be waiting for you after you exit the domestic arrival terminal through the glass sliding doors. Our team will be holding up a paper with your name written on. Where is the meeting point at the domestic departure terminal? We will wait for you nearby the entrance of the domestic departure terminal building. 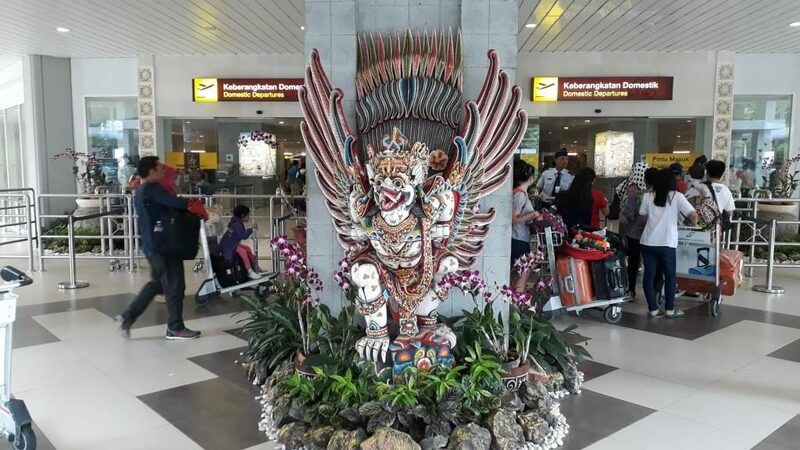 There is a large wood carving of Garuda, a mythical bird-like creature. How will my luggage be stored? All luggage is locked away in one large store room. All items get a number tag and are logged in our system. Customers can only enter the store room under direct supervision from one of our team. If you wish to re-pack your luggage then we provide a space outside the store room. Will my things be protected? The store room has double locked doors, CCTV cameras and constant supervision. There store room has climate control, a smoke detector and fire extinguishers. We ask you not to store food, flammable items and illegal items. We do reserve the right to refuse storage. We offer a re-reimbursement of up to USD 400 per bag for damaged or lost goods. Payment for storage is upon return of luggage. A deposit or advance payment is not required. We do accept secure online credit card payments. Credit card payments by VISA, MasterCard and JCB are accepted. When payments are made by credit card we request payment to be made before we return your luggage. Our team will send you a payment request that can be paid online through a secure connection. Yes. We can process secure online payments by PayPal. As Indonesian Rupiah is not available on PayPal we will convert the Rupiah amount to either US Dollars or Euros (your choice). When payments are made by PayPal we request payment to be made before we return your luggage.